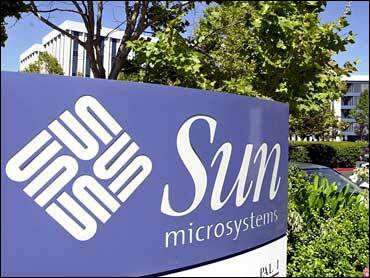 Sun Microsystems Inc. shares soared Wednesday after a published report said International Business Machines Corp. is in preliminary talks to buy Sun for at least $6.5 billion in cash. The Wall Street Journal, which cited unnamed people familiar with the matter, said the deal could occur as early as this week. It also said the talks could fall apart. Sun Microsystems shares climbed $3.09, or 62 percent, to $8.06 in morning trading, while IBM lost $2.77, or 3 percent, to $90.14. IBM, of Armonk, N.Y., and Sun Microsystems of Santa Clara, Calif., both make computer systems for corporate customers, and the newspaper said a purchase of Sun would help IBM in the finance and telecommunications markets. An IBM spokesman did not return calls seeking comment Monday morning. Sun spokeswoman Karen Kahn declined to comment. While some of their technologies and customers overlap, IBM and Sun have been heading in different directions for most of the past decade. Sun, a darling of the dot-com era, has been struggling since the tech bust of 2001 to find its place. The company has cut thousands of jobs and tried to refocus on open-source software besides the proprietary systems it built much of its wealth on. IBM, after an enormous restructuring in the 1990s, has proven one of the technology industry's most reliable earners. It has gobbled up dozens of companies in recent years. But a $6.5 billion deal would be its biggest to date. It also would represent a big premium for Sun, which closed trading Tuesday with a market capitalization of less than $4 billion.